Rough Slate is notorious for homeowners to maintain as dirt can quickly become trapped in the rough surfaces. The example on this page is that of Brazilian Semi Riven Slate installed in the Kitchen of a house in the village of Hornby, which while naturally cleft from the rock loses none of its texture and style and yet has a much smother appearance than the typical rough Slates from China. Less processing means it’s not quite completely smooth but it is a lot less expensive to buy than say a honed or polished Slate which is more difficult to maintain due to various polishing techniques required to keep up the appearance. 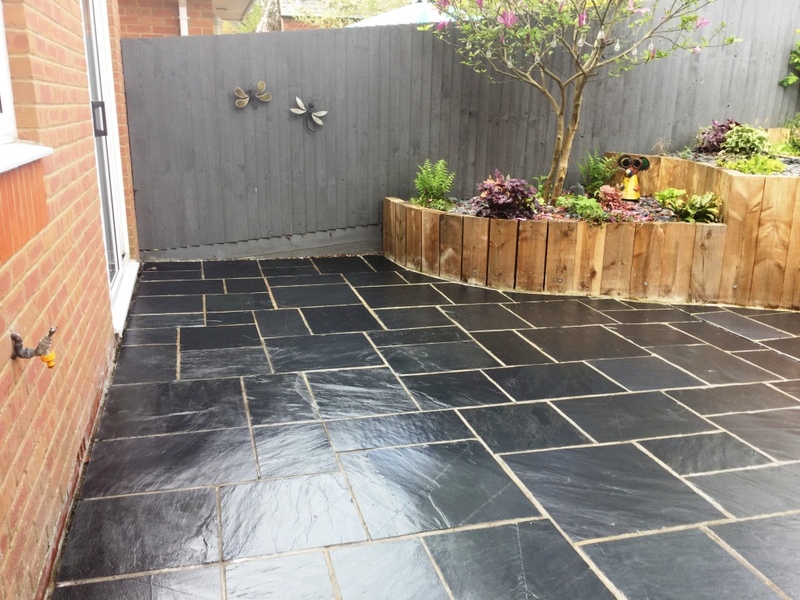 Brazilian Slate is in fact one of my favourite slates to clean and also one of the most rewarding of Slates to seal as the sealer really does bring out the colour and character of the stone. Sealers provide a protective barrier on natural stone floors and without it dirt can penetrate into the pores of the stone making it more and more difficult to clean effectively. 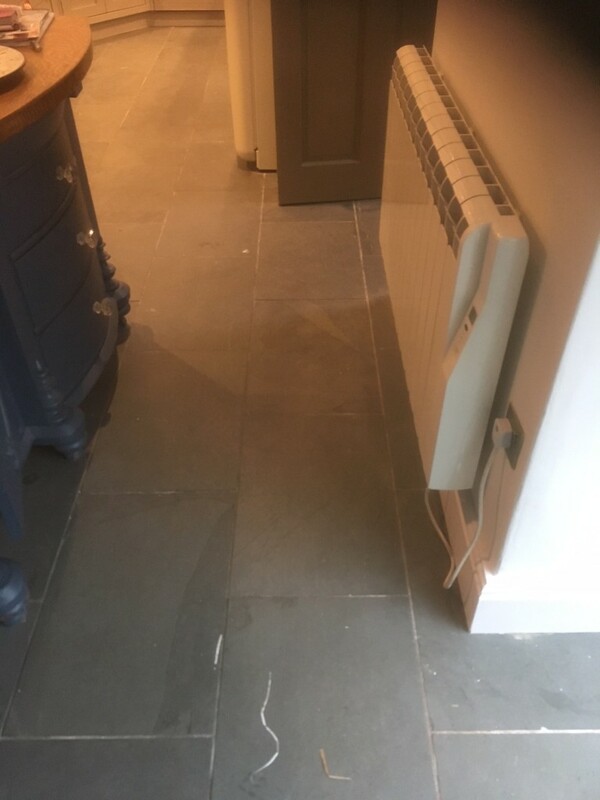 Unfortunately on this floor the new homeowners were unaware on what sort of Stone it was and had no idea how to look after it which resulted in the sealer wearing down prematurely and the floor becoming dull and un-inviting. To restore the appearance of the Slate floor we started by taping up the edges of the new kitchen units to protect the wood from splashing. 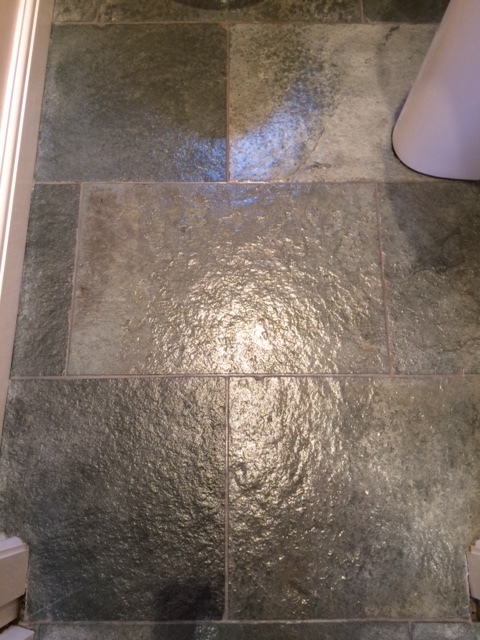 This was followed with an application of a strong dilution of Tile Doctor Pro-clean worked in with a black buffing pad fitted to a buffing machine running at slow speed (working at a slower speed results in less splashing). The pads can struggle to reach the edges and corners so these were cleaned by hand. Once we had finished on the main floor area we then concentrated on the grout using a steam cleaner and more Pro-clean scrubbed in with a narrow stiff brush. 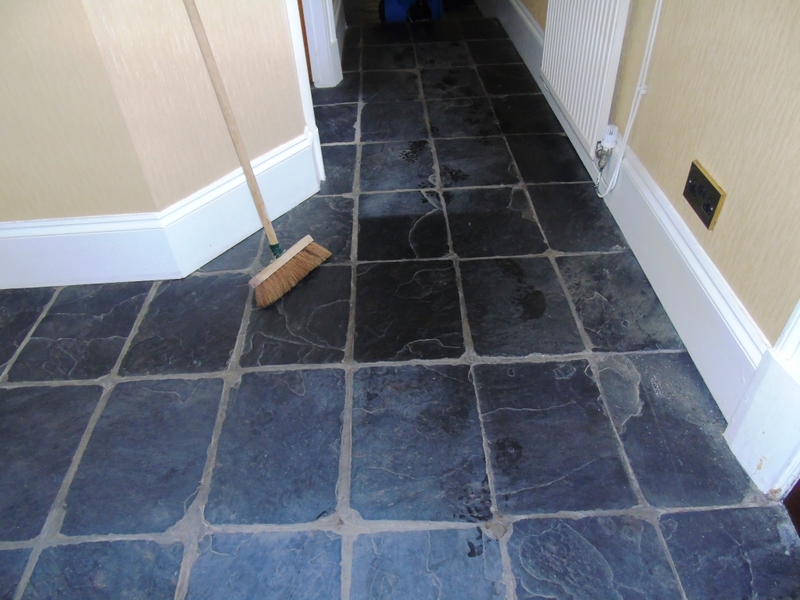 Last step of the cleaning was to rinse the floor with water to remove any trace of cleaning products from the Slate and then dried off the floor the best we could with our high wattage wet vacuum machine and left the floor to dry off naturally over night. The next day we returned to seal the floor checking first that the floor had completely dried. The customer had requested a matt finish however we have worked on Brazilian Slate many times before and we knew how good they can look with this Satin finish sealer. Naturally its the customers decision so we offered to do a test piece and let them decide if they didn’t like it we would strip off the test piece and apply a Matt finish sealer like Tile Doctor Colour Grow instead. The floor was dry so a couple of coats of Tile Doctor Seal and Go were applied to one Tile so that they could appreciate how it would look. Luckily the customer agreed with us and so we set about sealing the whole floor with Seal and Go. To speed up the drying process Air Blowers were installed as we worked and it wasn’t long before the sealer was dry and the customers were able to walk on the floor and inspect every area before we left. I’m please to report that they were over the moon with the floor and my recommendation of sealer. 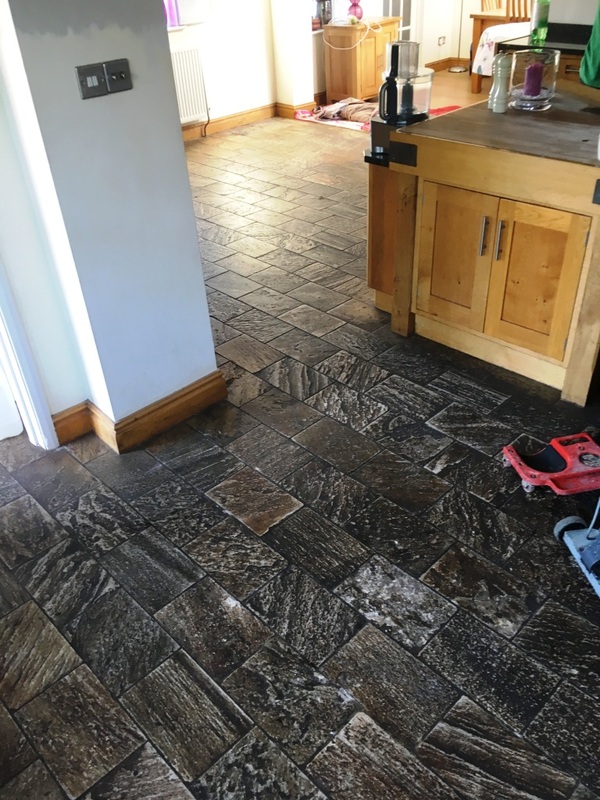 To maintain the slate tiles going forward we always give our customers a free bottle of Tile Doctor pH neutral tile cleaner, which is a little incentive for them to provide some feedback via our website. 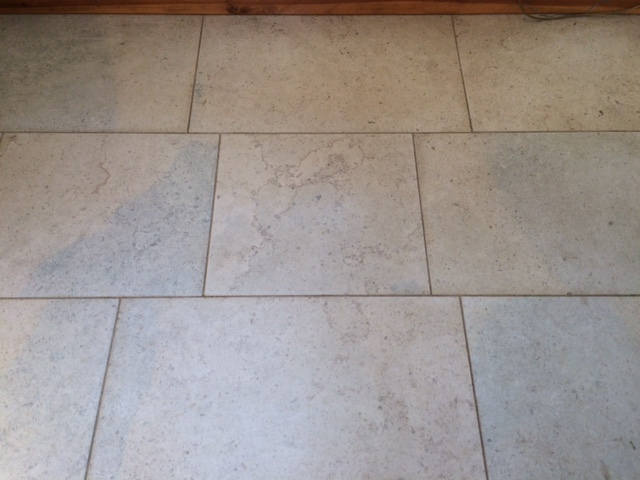 The single most important thing you need to do after having a new natural stone floor installed is to seal the tiles. 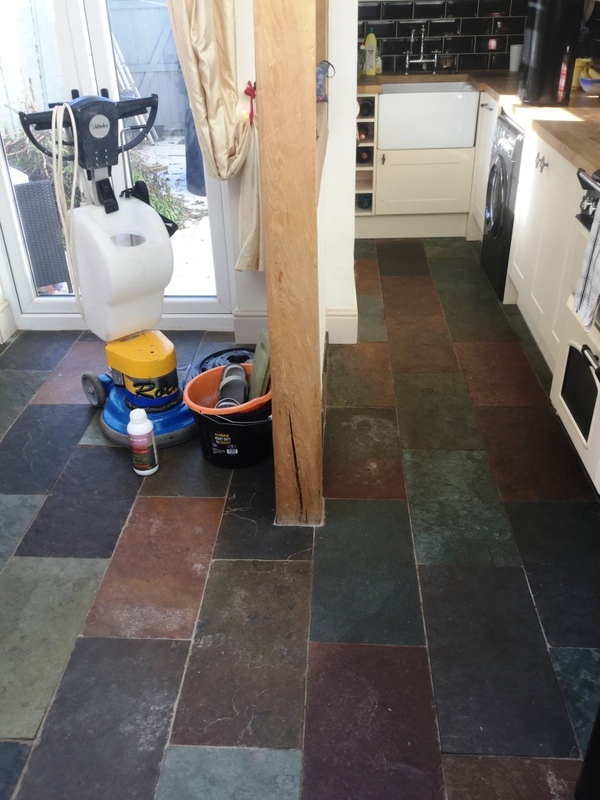 The sealant acts as a barrier of protection for the stone against ingrained dirt, so without it the floor will become very difficult to keep clean. This is the exact problem faced by my recent customer, who lives in the town of Thaxted in North Essex. Thaxted is a very historic place with over 1000 years of history and several fantastic medieval houses. 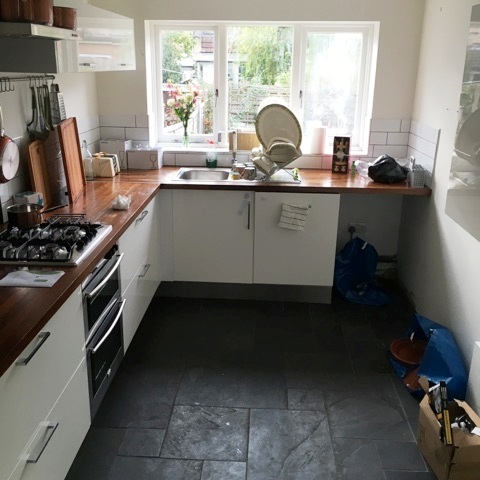 The Slate kitchen tiles in the property had not been sealed after installation and, despite Slate being naturally durable and hard wearing, the tiles had quickly become dull and difficult to keep clean. Despite valiant efforts at a DIY restoration, the customer required our professional assistance with deep cleaning and sealing the tiles to restore them back to their best condition. To begin the cleaning process, I applied Tile Doctor Remove and Go across the floor and scrubbed it in using a slow speed rotary machine fitted with a scrubbing pad. Remove and Go is a multi-purpose product: it strips away any old sealer, adhesive and paint stains, and draws out ingrained stains and removes heavy soil build-up. The resulting slurry was then removed using a wet-vac machine. Next, I focused my attention on the dirty grout lines, treating them with a strong solution of Tile Doctor Pro-Clean which was then scrubbed in along the grout line using a stiff brush. 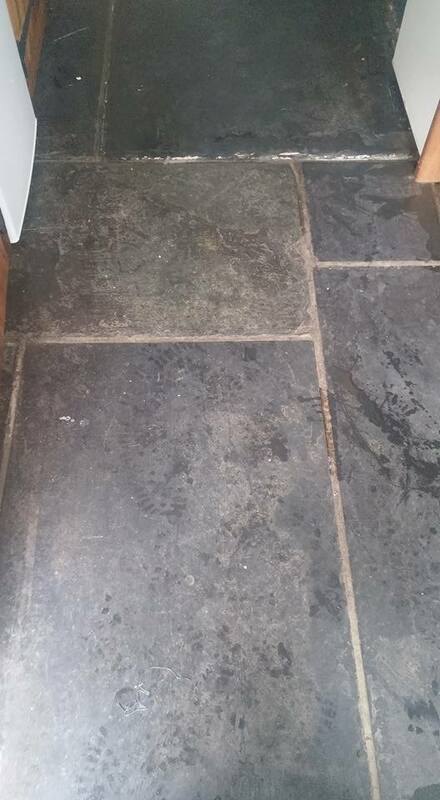 There was still evidence of some grout haze on the stone following installation some years back so the floor was then treated to an acid wash using Tile Doctor Grout Clean-up which is a concentrated phosphoric acid cleaner designed to life grout smears haze (smears). 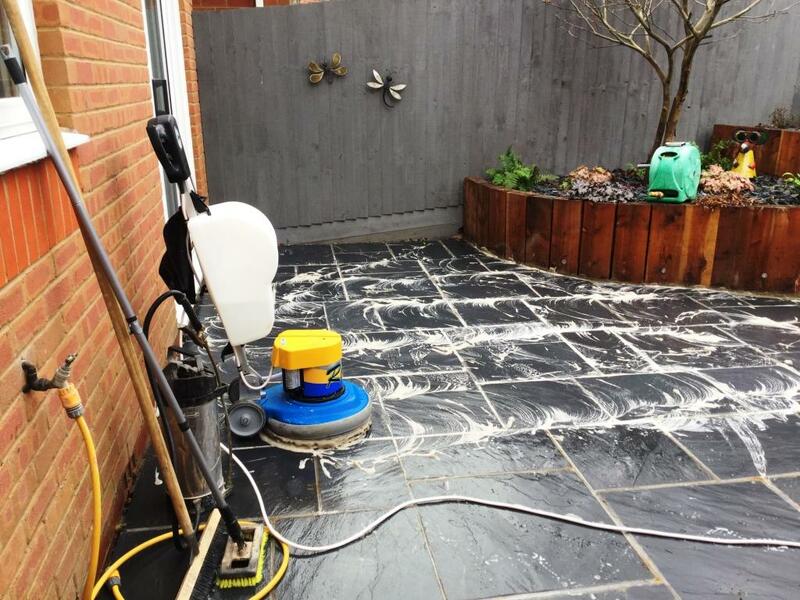 Once done I pressure washed the floor using a specialised spinning tool which blasts the tiles and grout with water to remove ingrained dirt from the most difficult-to-reach areas in the stone. The water is subsequently vacuumed back into a holding tank in my van without causing any splashing or overspill. The customer was keen for the restoration to be finished within the space of a single day, so I installed a few Dri-Pod floor dryers to get the floor dry and ready to be sealed in no time. We typically leave at least 24 hours for these types of floors to dry naturally, but in this scenario the floor dryers were able to remove any excess moisture. To complete the restoration, I applied four coats of Tile Doctor Seal and Go Extra to the floor to seal it. This a special acrylic-based sealer that protects the stone and allows for moisture vapour transmission. The makes it ideal for situations in which no damp proof membrane has been installed. The addition of the sealer gave the floor a beautiful lustre – as you can see from the photos below – and will make the floor much easier to keep clean in the future. 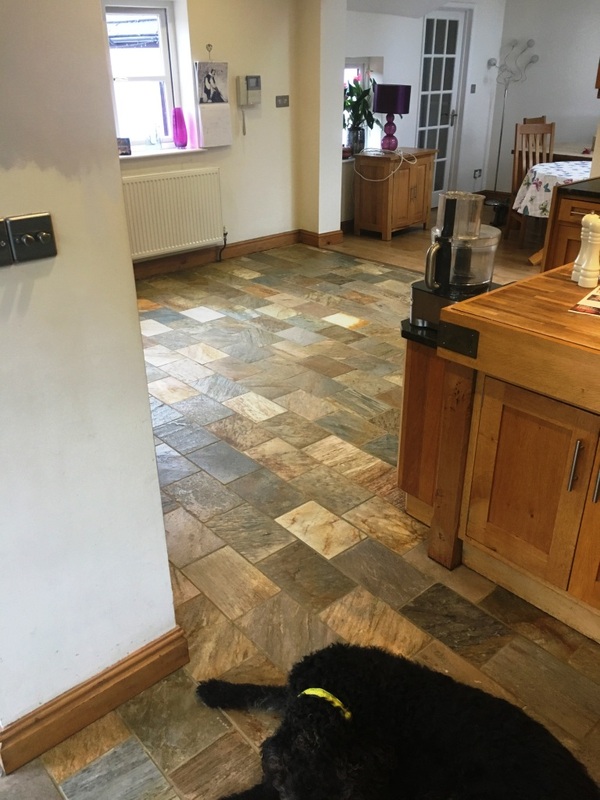 After months of difficulty, the customer was over the moon that the floor had finally been restored to its peak condition. 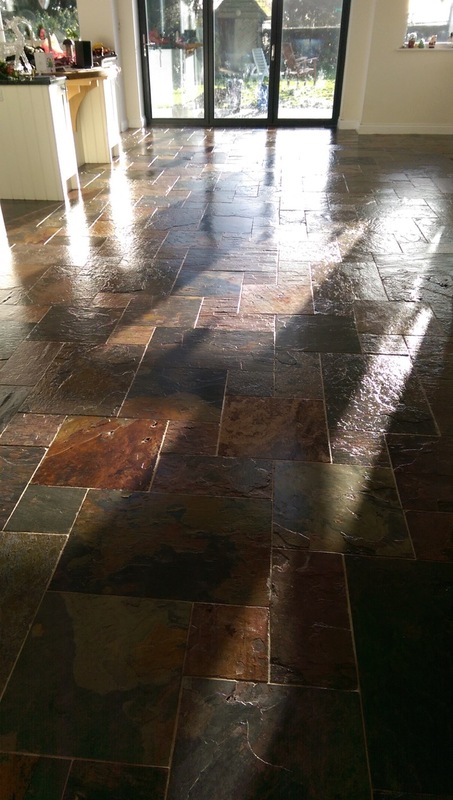 Sealing is a fundamental part of any stone floor installation. 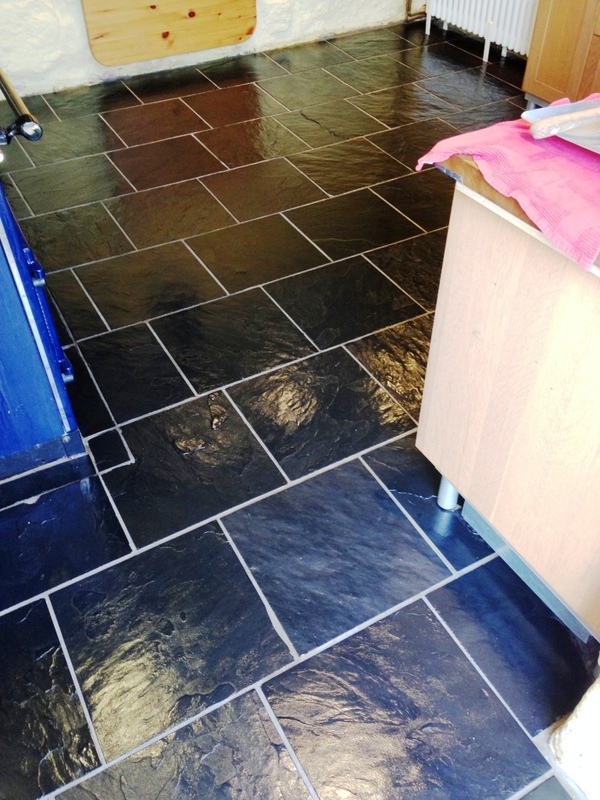 If your builder or tiler hasn’t sealed your floor, he’s done something wrong – and it can cause significant problems. To the untrained eye, it may be difficult to tell whether a floor has been sealed, but you will quickly see that an unsealed floor attracts a lot of ingrained dirt and loses its lustre easily over time. This was a problem for one of my recent customers, who lives in Milton Keynes in Buckinghamshire. 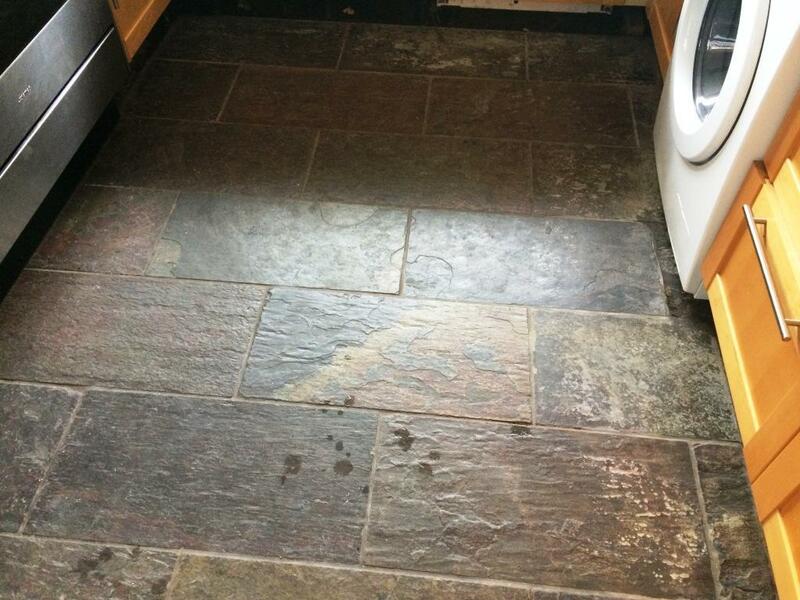 They have a Slate tiled Kitchen floor which had been laid approximately 5 years prior, but had not been sealed properly on installation – and had not received any professional treatment since. Consequently, the floor had become difficult for the customer to keep clean and it had lost its lustre and coloration due to ingrained dirt. Additionally, recent building works had left thick deposits of plaster on the tiles. 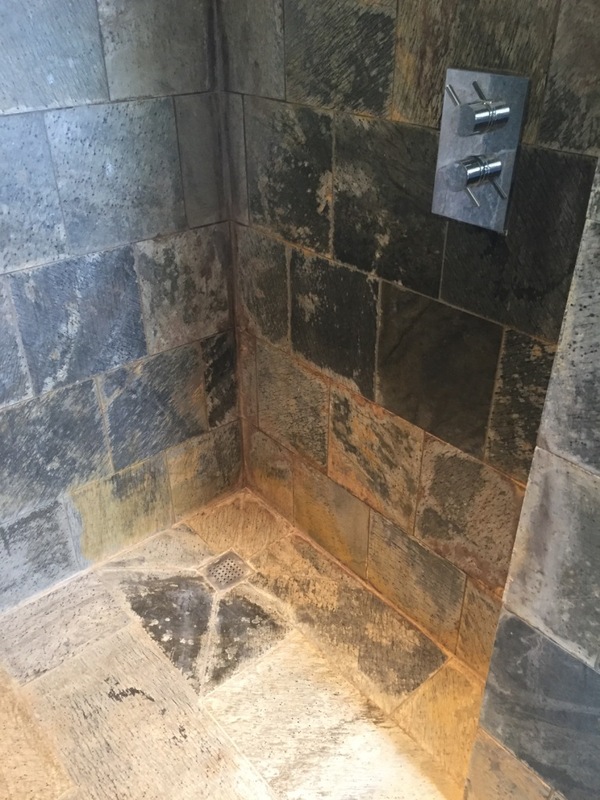 To begin restoring the Slate tiles, I applied Tile Doctor Pro-Clean, which is a powerful alkaline-based cleaner for natural stone. I mixed a strong dilution of the product, spread it liberally across the area and left it to dwell for 20 minutes to seep into the pores of the stone. Next, I scrubbed it into the stone using a brush fitted to a heavy weight rotary machine, before rinsing the floor with a high-pressure water and wet extraction unit. The next stage of the cleaning process was to get rid of the plaster deposits and some of the heavier stains. To deal with these I needed to apply an even stronger cleaner, known as NanoTech HBU (Heavy Build-Up Remover). As its name suggests, the product uses nano-sized cleaning particles to penetrate beneath difficult stains to dissolve them and lift them out. I did this in combination with a steamer to help loosen up some of the plaster. After allowing the floor to dry overnight, I returned to the property the next day to seal the tiles. I did this using five coats of Tile Doctor Seal and Go, which is a double-action sealer: not only does it provide a robust, topical seal, it also provides a durable low-sheen finish which is aesthetically pleasing. 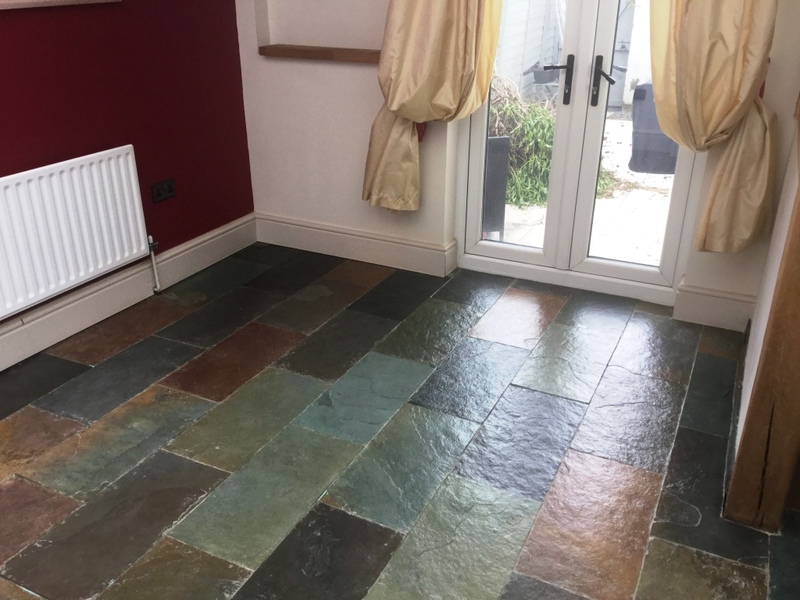 The sealer has done a fantastic job of emphasising all the natural colours in the Slate and the appearance of the entire floor has been lifted. The customer was really pleased with the restoration which certainly had been a long time coming. 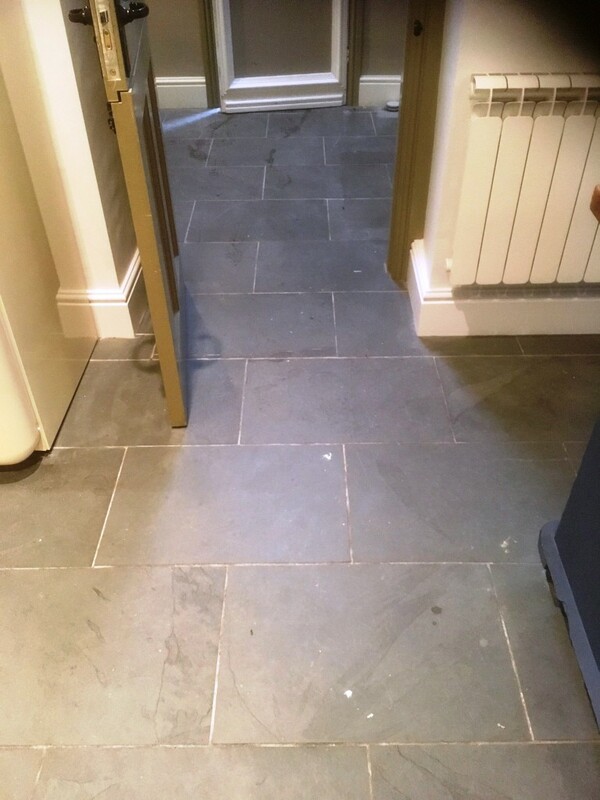 This Slate tiled floor in the hallway of a property in Gloucester had been laid 28 years ago, but during this time had received no proper maintenance. The property owner used to clean the tiles once a week using a steam cleaner to little effect. In fact, we don’t normally recommend steam cleaning sealed surfaces as it will erode the sealer prematurely. After countless years of steam cleaning, I was confident that any traces of old sealer on this floor would be non-existent at this point. This is, of course, a problem because a lack of sealer exposes the stone to ingrained dirt and stains. The effects of this are shown in the photos below: as you can see, the Slate had completely lost its lustre and naturally colourful patina. 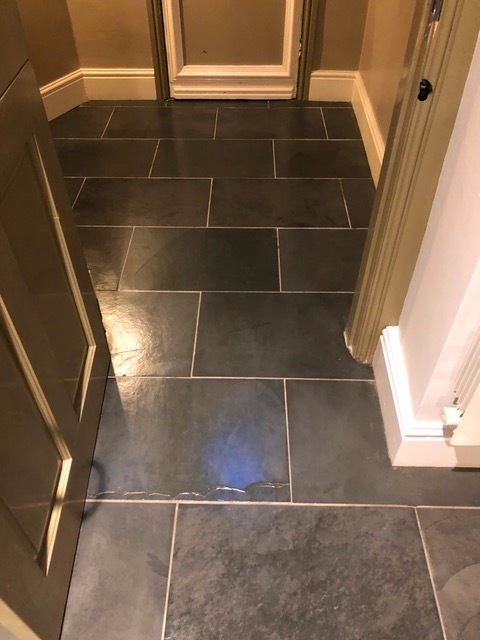 I was asked by the property owner to provide this Slate tiled hallway with the restoration that was so long overdue, so I travelled to the house in Gloucester, a city situated near the Welsh border and between the Cotswolds and the Forest of Dean. I started the restoration by mixing a strong solution of Tile Doctor Remove and Go combined with Tile Doctor NanoTech HBU. These two products serve different purposes. Remove and Go is a stripper designed to break down any traces of old sealer that might still have existed, as well as any paints and adhesive markings; NanoTech HBU is a potent cleaner which contains nano-sized cleaning particles that penetrate deep into the stone to get underneath tough dirt and stains to dissolve and lift them out. This cleaning solution was spread over the floor and left to dwell for 30 minutes, before being scrubbed in using a black scrubbing pad fitted to a buffing machine. A thick black slurry resulted from this process and this needed to be removed using a wet vacuum. 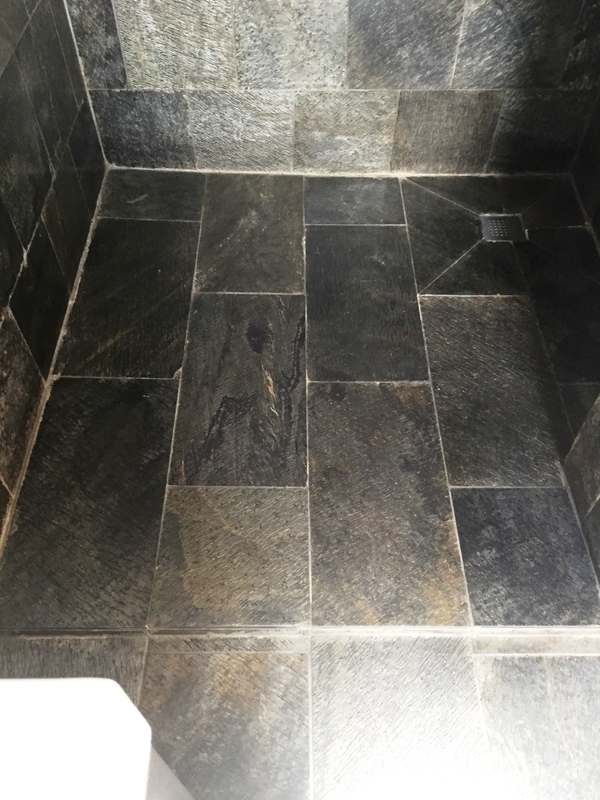 Next, I repeated this cleaning process using Tile Doctor Pro Clean, our reliable alkaline cleaner, to provide a more thorough clean for the tiles and grout. The slurry was once again removed using a wet vacuum, before I then rinsed the whole floor with fresh water to remove any traces of chemicals. When satisfied with outcome of the cleaning process, I left the floor to dry overnight. Upon arriving back at the property, the next day, I ran some quick moisture tests to check that the floor was dry. Thankfully, there were no damp issues and I was able to seal the tiles using four coats of Tile Doctor Seal and Go, leaving each coat to dry before applying the next. Seal and Go is a water based sealer (so no smell as it dries) which adds durable stain resistance and a low-sheen finish that brings out the best in the slate. The customer’s reaction to the outcome of the restoration was fantastic. She never expected the floor to turn out so beautifully and was very pleased. This house in Wantage was on the market to be sold but many potential buyers had been put off by the poor condition of the Slate tiled shower cubicle. Wantage is a lovely little market town in the south of Oxfordshire and a desirable location to live. However, before this house could be sold, the shower cubicle needed to be renovated; as you can see from the photos below, there was a heavy build-up of limescale that needed to be removed. With the property owner keen to sell the house, he asked me to get the shower cubicle back to looking its very best. This would involve a deep clean, acid wash and seal. To begin the restoration, I cleaned the walls using Tile Doctor Pro Clean. This is a strong alkaline product which is powerful and sage to use on natural stone to eradicate dirt and residue that has built up over time. I scrubbed the Pro Clean into the tiles and grout lines, before rinsing the entire area with fresh water. The next stage involved removing the heavy build-up of limescale. This was done using Tile Doctor Acid Gel, which is a blend of phosphoric and hydrochloric acids in gel form. Being in this form makes it especially effective for use on sloped and vertical surfaces as it it’s easier to control and can dwell for a long time where required. The product deals with alkaline-based limescale and mineral salt deposits (efflorescence). I scrubbed the Acid Gel into the affected areas with a stiff nylon brush, before rinsing with fresh water. I then needed to repeat this process twice more to make sure all the limescale was completely removed. Following this, I left the shower to dry before sealing. After letting the shower cubicle tiles dry, I sealed them using Tile Doctor Colour Grow, which is an impregnating, colour-enhancing sealer. 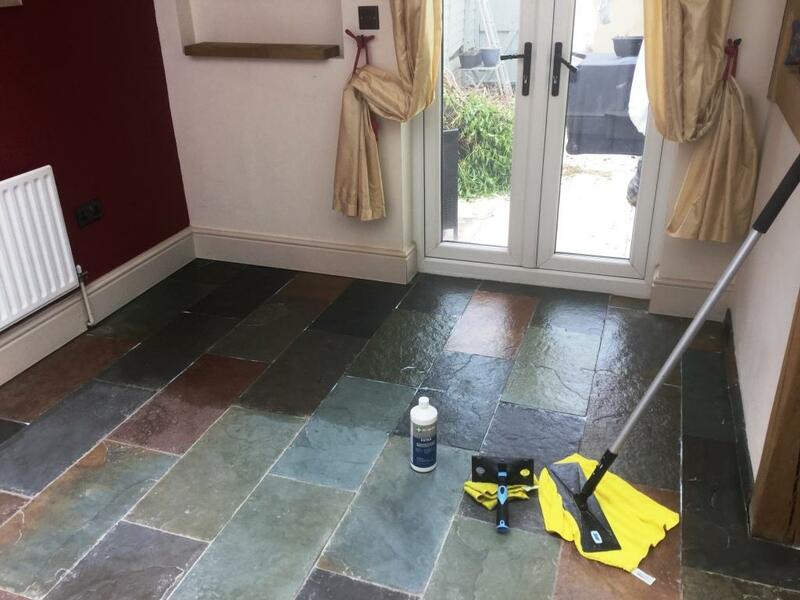 The sealer is specially formulated to really emphasise the different natural tones and shades in the stone, in turn lifting the appearance of the entire room. In this situation, two coats of Colour Grow were used to provide robust, long-lasting protection. The customer was very impressed with the finished result and I’m sure any prospective property buyers will be equally impressed by the feature bathroom! Another satisfied client. 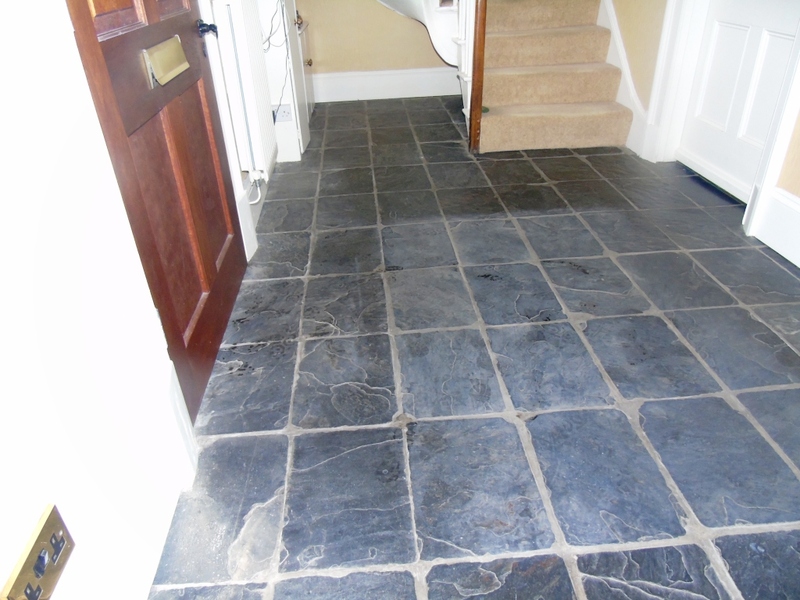 These lovely old Slate flagstones were reclaimed form an old waterworks in Exeter about twenty years ago and had been laid in an old fisherman cottage in Dawlish during a sympathetic renovation, replacing an old floor that had been laid in the 1970s (which have a lot to answer for with old houses!). The flagstones really looked the part and were larger and thicker than usually available on the market new. Other than being dirty and a pain to clean because of the dogs living in the house, around the edges of some of the larger tiles there was some sort of fluorescent orange residue which was up to 10mm thick in places and as hard as the stone it was adhered to. Dawlish is a lovely little fishing harbour village on the South-East Cornwall coast with lots of interesting history. For hundreds of years the practice of smuggling imported goods prospered in the area thanks to its convenient harbour. The village is home to only around 5,000 inhabitants. 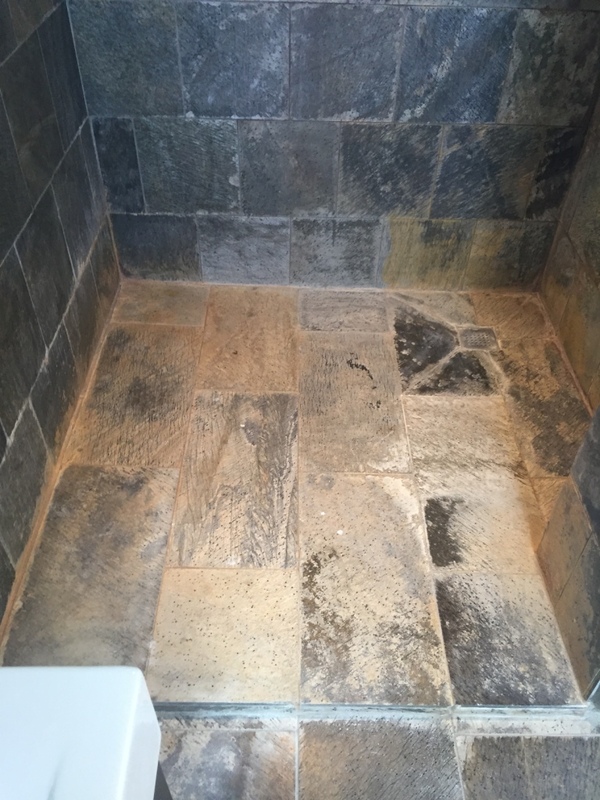 As you can see from the photo below, the tiles – along with the grout lines – were very dirty and stained. No wonder the property owner was beginning to give up on salvaging them! However, I assured the customer that with the right cleaning products and techniques, I could make a significant improvement to the condition of the floor. To tackle the orange residue staining I used a grout removal tool which allowed the natural texture of the stone to remain rather than smoothing off the whole edge. 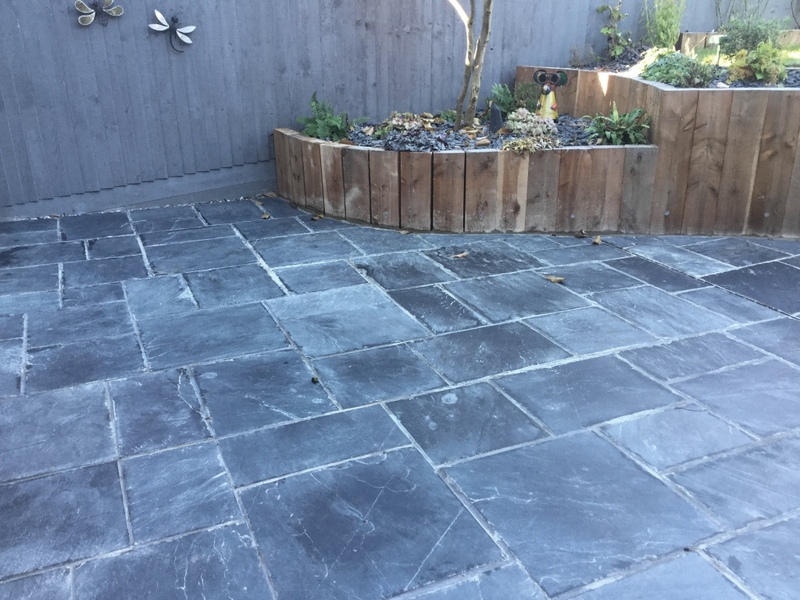 The dirt and staining in the slate flagstones however was so deeply ingrained I felt it best to strip back the affected layer of stone using a process known as burnishing. This involves the application of diamond encrusted burnishing pads to the floor, effectively grinding away the muck to reveal a cleaner surface beneath. 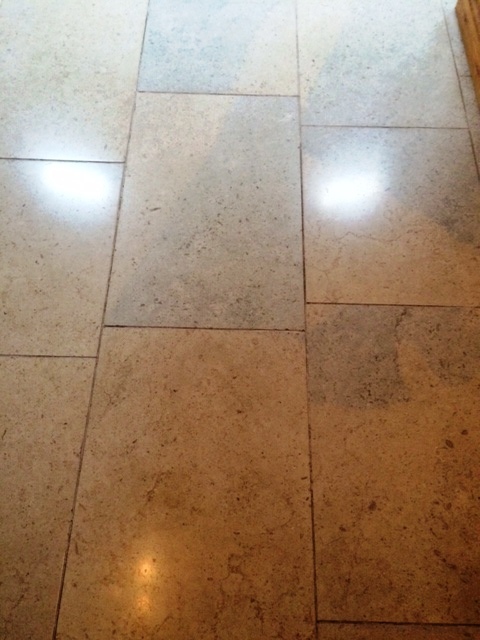 When dealing with polished stone such as Limestone, Marble and Travertine, we will normally use a system of four burnishing pads – each with a different level of grit – to gradually restore the shine to the tiles. 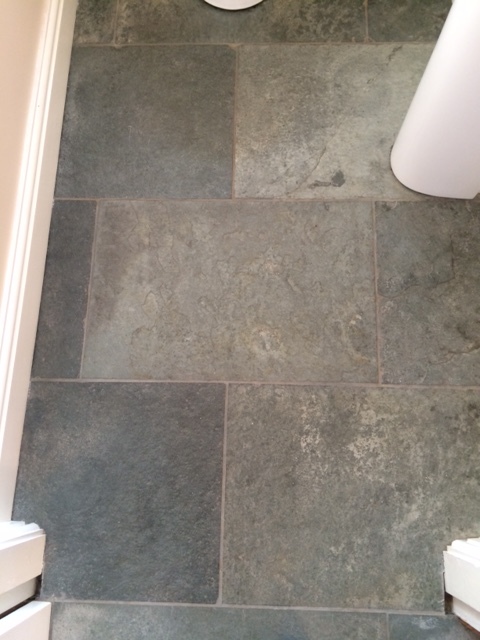 However, in the case of these rustic, unpolished Slate Flagstones, I opted only to use only the Coarse and Medium grit burnishing pads to cut back the affected layer of stone, leaving a surface that could subsequently be scrubbed using Tile Doctor Remove and Go. This is a multi-purpose product that strips away any old sealer, adhesive marks and paint stains, while also cleaning the stone and grout. This process ensured all traces of old sealer were removed and that the whole floor was left fresh and clean. The resulting soiled solution was extracted from the floor using a wet vacuum and the whole area rinsed with fresh water to remove any traces of cleaning product. To end the first day of work, the floor was left to dry overnight. The village the cottage is situated in is very isolated to traffic; there is a car park at the top of the town and the only option is to walk the nearly half a mile each way to the cottage on the harbour so streamlining the kit used was a necessity! In the end two trips each way go the kit required there and back with the biggest machines being a wet vac and a rotary scrubber. Returning to the property the next day, I ran some damp tests to check if the floor was dry and ready to be sealed. This is particularly important in older properties like this, as it’s quite likely that there is no damp proof course present and moisture issues are far from uncommon. Thankfully, the tiles proved dry and I could seal them using Tile Doctor Colour Grow. 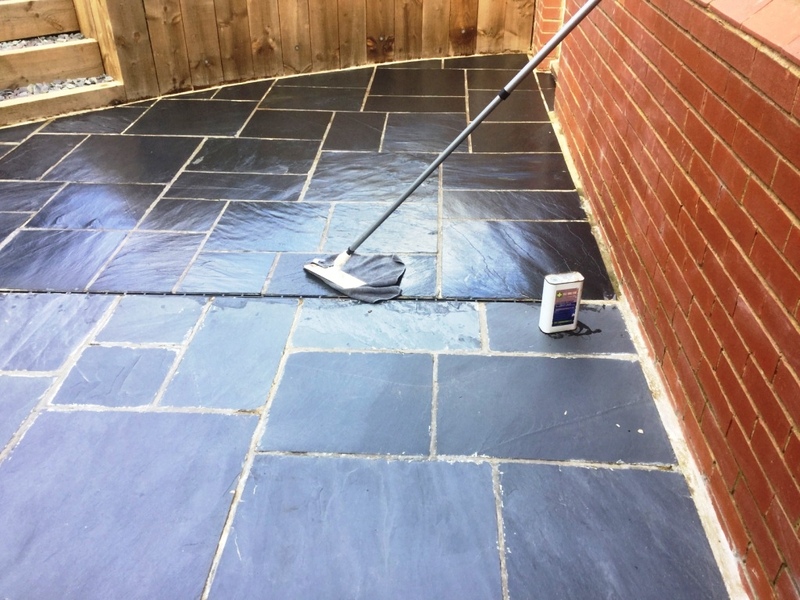 This impregnating, colour-enhancing sealer provides a robust seal, as well as a natural-look matte finish which really matches the character of these original Flagstones. It also really lifted the natural shades in the stone. The customer was ecstatic with the result. 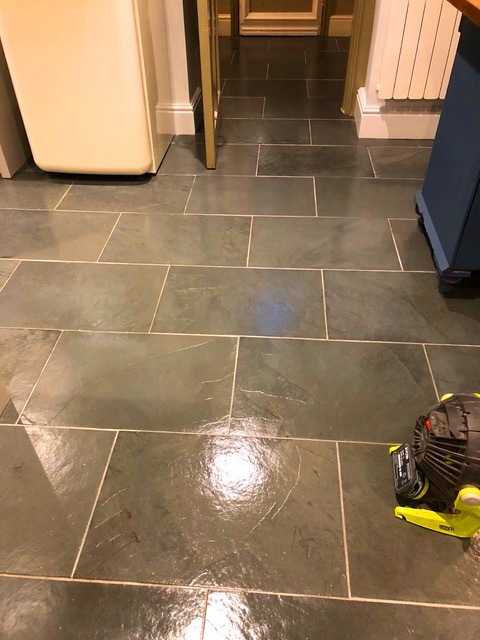 To make sure the floor can be kept looking great for many years to come, I recommended that the customer clean it regularly using a product called Tile Doctor Stone Soap. It’s specially formulated for the routine maintenance of natural stone floors; not only will it clean the floor very well, it will also continue to add to the natural patina of the stone. Honiton is an old market town in East Devon with some interesting history. Most of the main buildings in the centre town are Georgian – dating back to the 18th century – and the town has been the site of the annual Honiton Agricultural Show since 1890. I visited this quaint area not too long ago to visit a customer. 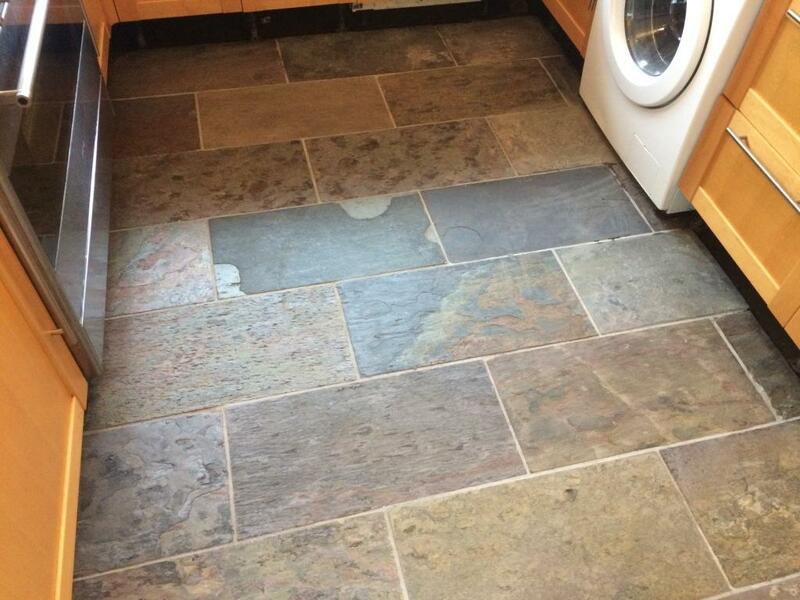 The customer’s Slate tiled kitchen floor, as you can see from the photograph below, was looking worst for wear. 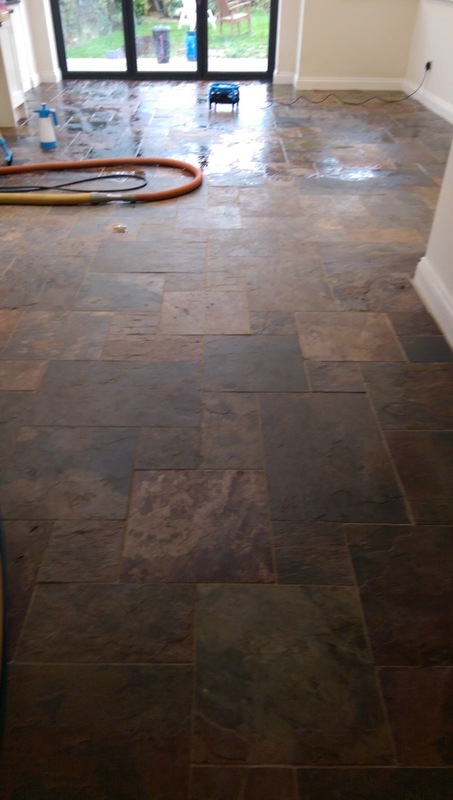 The sealer had worn off and dirt and grime had penetrated the pores of the stone, this made the tiles difficult to clean and the new owners of the house were having trouble improving the appearance of the floor. They thought that the tiles were laid about eight years previously but that there had been no real cleaning or maintenance on it. 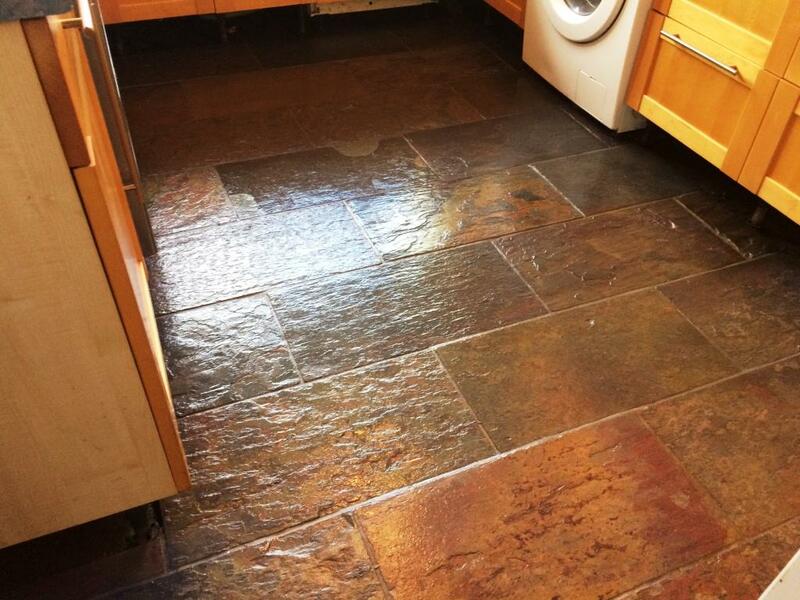 I was called in to get this Slate tiled kitchen floor back to looking its best and easy to clean. In this case the sealer that had been used was past its best and was attracting dirt and holding it in, so the only option would be to completely strip the floor and re-seal. The grout had also been discoloured over the years and there are a few options to get grout looking its best again. Grout is more prone to discolouration than the tiles but usually comes up well using Tile Doctor products Remove and Go, Pro Clean or Duo Clean. If the grout is discoloured beyond repair a grout recolour is the best way forward and a variety of colours are available. This floor was stripped of old sealers using Tile Doctor’s Remove and Go, a strong alkaline stripper and degreaser plus coarse buffing pad on a rotary scrubber to remove any traces of previous sealers plus normal kitchen oils and stains. The grout was also scrubbed for good measure using a special grout brush and the floor was thoroughly rinsed with water and a wet vac to ensure that any remaining chemicals were neutralised and removed. This process left the floor fresh and clean – and ready to be left to dry completely overnight. After leaving the floor to dry overnight, I returned to the property to seal it. Before doing so, I ran a few damp tests – aware that the property is reasonably old and may not have a damp proof membrane installed. Any excess moisture can cloud the sealant and damage its performance, but thankfully this floor proved to be dry. I proceeded then to seal the tiles using Tile Doctor Colour Grow. This is our impregnating sealer which enhances the dark natural shades in the Slate, as you can clearly see from the photo below. As an impregnating sealer, it penetrates the pores of the stone to fill them and block dirt and stains from becoming ingrained. The restoration was truly transformative and as you can see from the picture above the grout came up very well so a recolour wasn’t necessary. Ross-on-Wye, an area located in South Hertfordshire and close to the Monmouthshire border in Wales, is known as the “birthplace of the British tourist industry” due to the Wye Valley’s picturesque river scenery, landscapes, and castles and abbeys. It is also known for the famous Ross and Monmouth Railway, which opened in 1873 and closed in 1959, and ran through the valley. 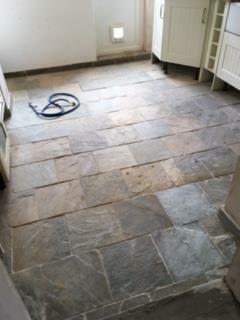 I visited an old cottage in the area to assist a customer with restoring a Slate tiled kitchen floor. 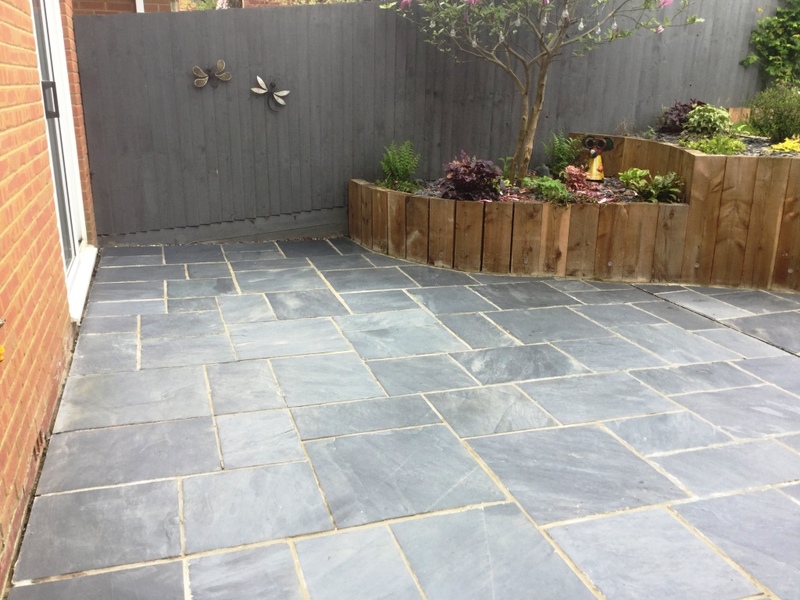 Slate tiles are particularly popular because of their versatility and durability, and truly they can be an asset to any property if the sealer is maintained correctly. 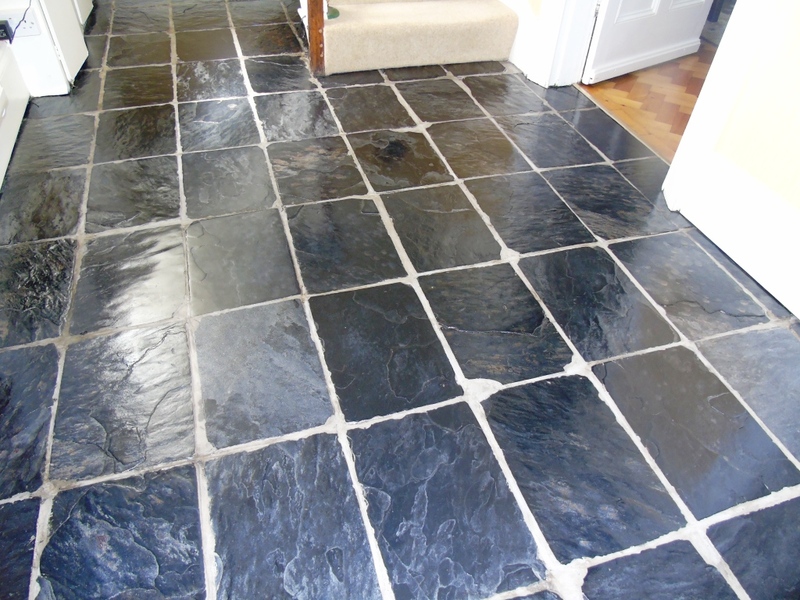 Slate tiles need to be sealed to prevent dirt penetrating the pores of the stone as ingrained dirt is difficult to remove and causes the stone to lose its appearance. In this case the floor had been laid around five years earlier and the sealer had worn off in places and was wearing very thin in others. As you would expect dirt had now become ingrained in the tile and the grout had also become stained in places. Overall this problem had left the floor looking very dull and unappealing, as you can see from the photograph below. To begin the restoration, I applied Tile Doctor Remove and Go liberally across the floor to strip away any remaining old sealer that was likely to be ineffectual and not preventing dirt from becoming ingrained in the stone. Next, I applied our strong alkaline cleaner, known as Tile Doctor Pro Clean to tackle that ingrained dirt. This was left to dwell on the floor and then agitated using a 17-inch rotary machine fitted with a black scrubbing pad. After cleaning the floor, I rinsed the tiles thoroughly with water and used a wet vacuum to clear the area of the resulting slurry. Following this I concentrated on cleaning the grout lines using Pro Clean in combination with a wire brush, before leaving the floor to dry out completely for the next couple of days. Later in the week, I returned to the property to seal the floor. Before doing so, however, I needed to test the floor for damp issues, especially since this was an old property and was unlikely to have a damp proof membrane installed. Running these damp tests are very important because excess moisture can cloud the sealer and damage its performance. Thankfully, there proved to be no issues, and the floor was fine to seal. 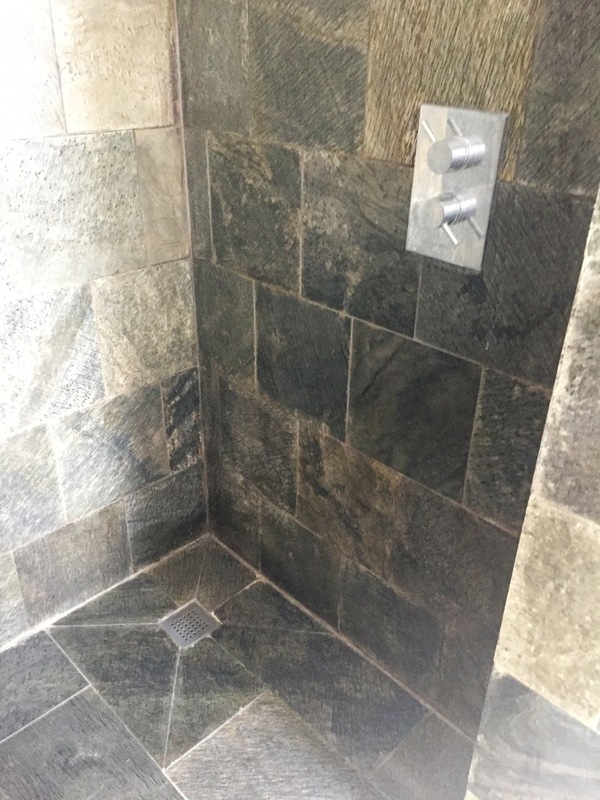 I did this using eight coats of Tile Doctor Seal and Go, which is a water based product (so no smell) that provides a durable, satin finish, and is recommended for use on a variety of tiles, including Quarry, Victorian, Sandstone and Terracotta. 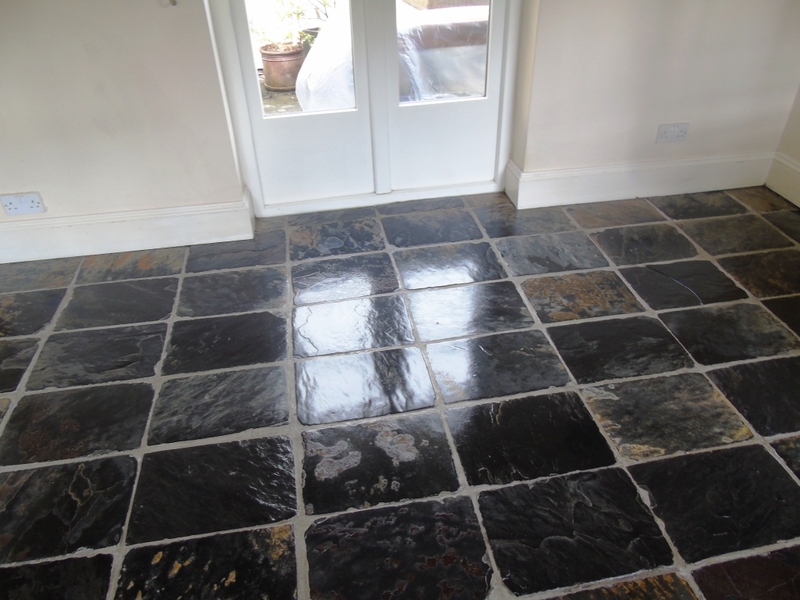 As you can see from the photo above, the restoration was transformative and really restored the lustre to this Slate tiled floor. Another satisfied customer! If you’ve ever rented out a property for a long period of time, you’ll likely to have been concerned, at one point or another, about whether the tenant can be relied on to maintain the condition of carpets, walls and, of course, tiled floors. This customer, who owns a property in Windsor (home to Windsor Castle, one of the official residences of the Royal Family) had encountered this very problem. 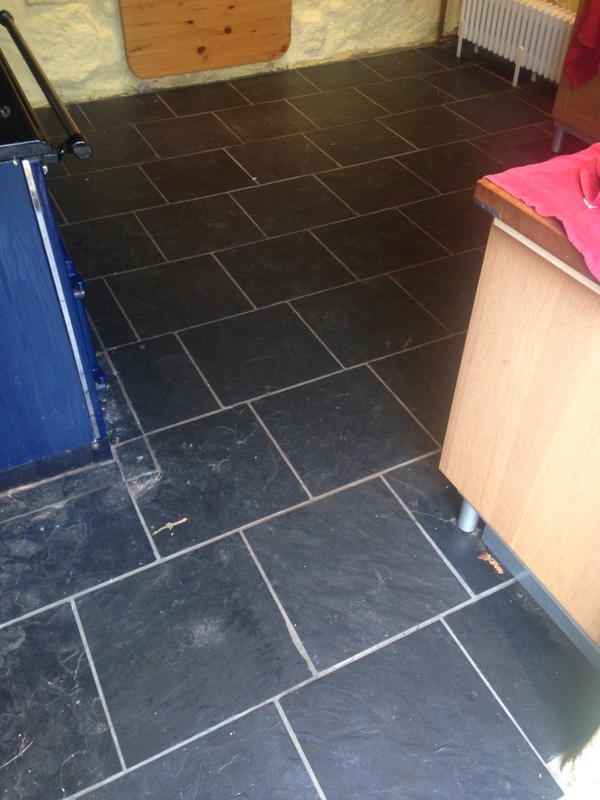 The property had been rented out to a tenant for the last five years, but the Slate tiled floor in the kitchen, which was itself only 10 years old, had not been maintained correctly. Consequently, the sealer on the tiles was worn out and no longer capable of protecting the stone against ingrained dirt and stains. There were also lots of efflorescent salts on the floor, predominantly contained in the high trafficked areas of the kitchen. I was contacted to correct the situation and restore the entire floor by providing a deep clean and seal. To begin the restoration, I mixed a strong solution of Tile Doctor Pro Clean and water. Pro Clean is a high alkaline cleaner capable of stripping away any old sealer and eradicating any soils and grease on the floor. The solution was spread liberally across the entire floor and left to dwell for a short period of time before being agitated and worked into the stone using a scrubbing pad fitted to a rotary machine. This process left the stone fresh and clean, but the grout lines were still suffering from efflorescent salts. Efflorescence is the deposit of salts on the surface of porous materials such as natural stone tiles as moisture rises through the floor, causing unsightly stains. These alkali salts were neutralised by acid washing the floor using Tile Doctor Grout Clean-Up, which is a concentrated phosphoric acid cleaner. After deep cleaning the tiles, I left the floor to dry thoroughly for 24 hours, which is usually the minimum drying period that we would suggest. Returning to the property the next day, I ran some quick damp tests to check for any excess moisture that might have prevented me from sealing the floor. 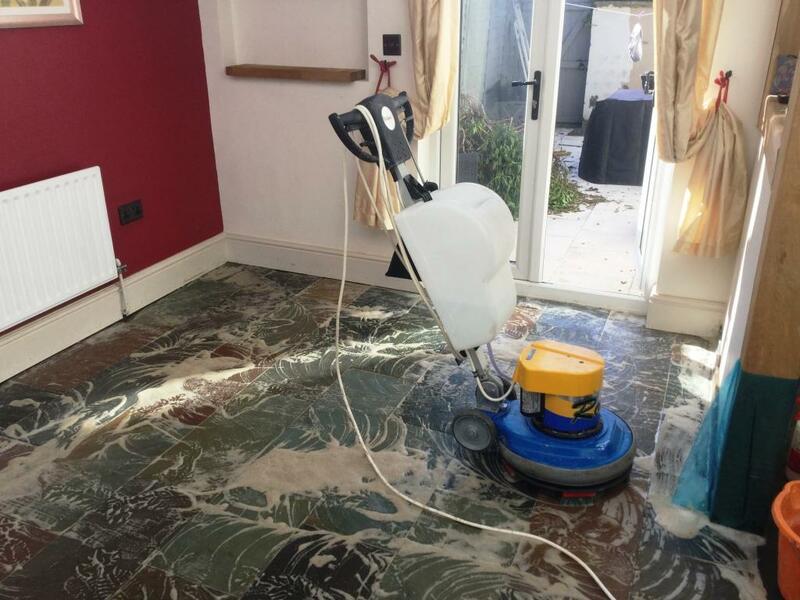 We will always do this as a precaution – especially with older floors that lack a damp proof membrane – because damp issues can damage the performance of the sealer and render it ineffectual. Thankfully, the floor proved try and I sealed the floor with Tile Doctor Seal and Go, which is an acrylic polymer sealer that provides an aesthetically pleasing low-sheen finish, as well as, of course, strong stain and ingrained dirt protection. 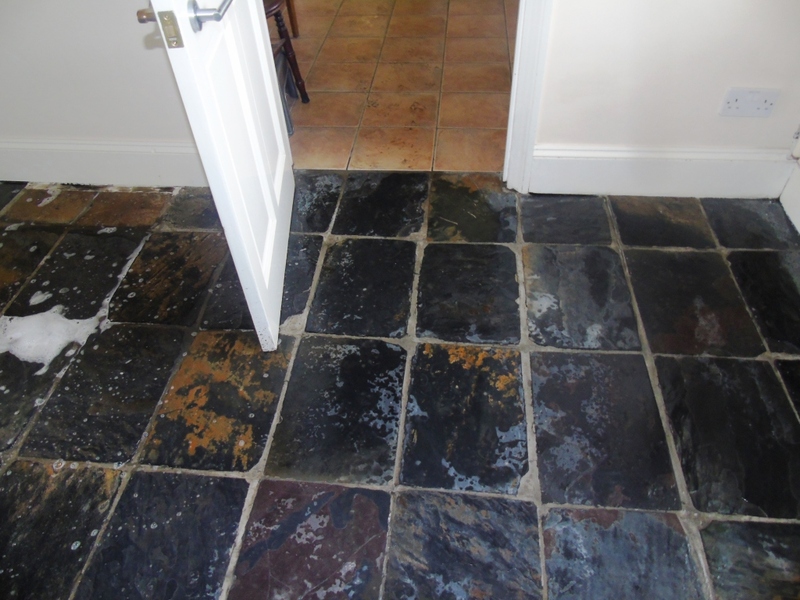 As you can see from the photos above, the restoration really brought this Slate tiled floor back to life after five years of poor maintenance. The customer was very pleased to have it restored back to its optimum condition – ready for the property to be rented out again! 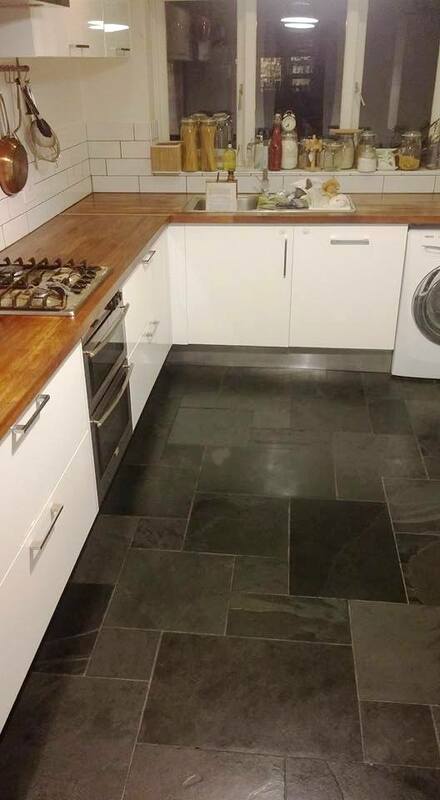 This is an interesting example of a Slate tiled floor that was the unfortunate recipient of a solvent-based topical coating which had become contaminated over time which completely altered its appearance. So much so, in fact, that the new owners of the property located in the village ofGamston, had not realised that this wasn’t what the floor was actually supposed to look like! The coating was hiding the natural beauty and character of the high mineral content Slate tiles. 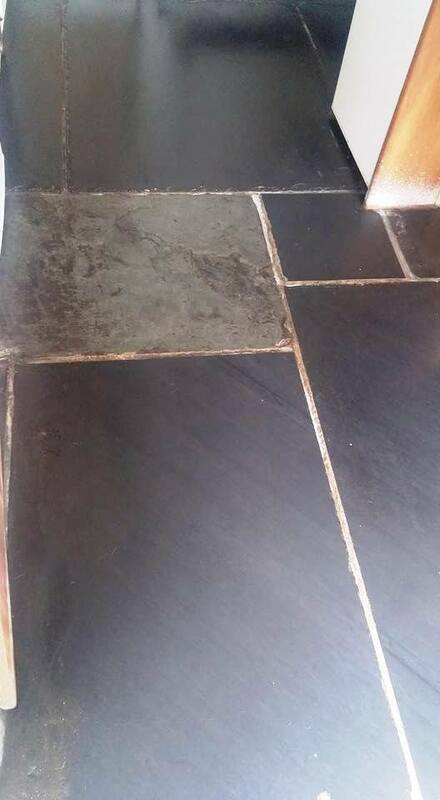 A previous tile cleaning company had tried and failed to remove this coating and clean the floor, having no real impact on the condition and appearance of the floor. This is because solvent-based topical floor coatings can only be removed using specialist chemical and mechanical techniques. I knew that Tile Doctor’s range of products, combined with my knowledge of cleaning techniques, would be effective, and I was booked in to complete the job. Here’s how I did it. To remove the solvent-based topical coating, I applied a heavy-duty coating remover from the Tile Doctor range, known as Tile Doctor Remove and Go. Remove and Go is, in fact, a highly versatile remover, formulated with a long dwell-time to strip away most coatings and sealers, epoxy grout haze, urethane coatings, synthetic finishes, adhesives and even paints. Once applied, the product was allowed to dwell for thirty minutes. Following this, I agitated the solution with a weighted heavy-duty rotary floor machine fitted with a restorative scrubbing brush. The resulting chemical slurry was vacuumed away and the floor was rinsed thoroughly to remove suspended residues. Next, working in sections, I forced dried the floor with an air mover and left it to dry off fully overnight so I could come back the next day and seal it. 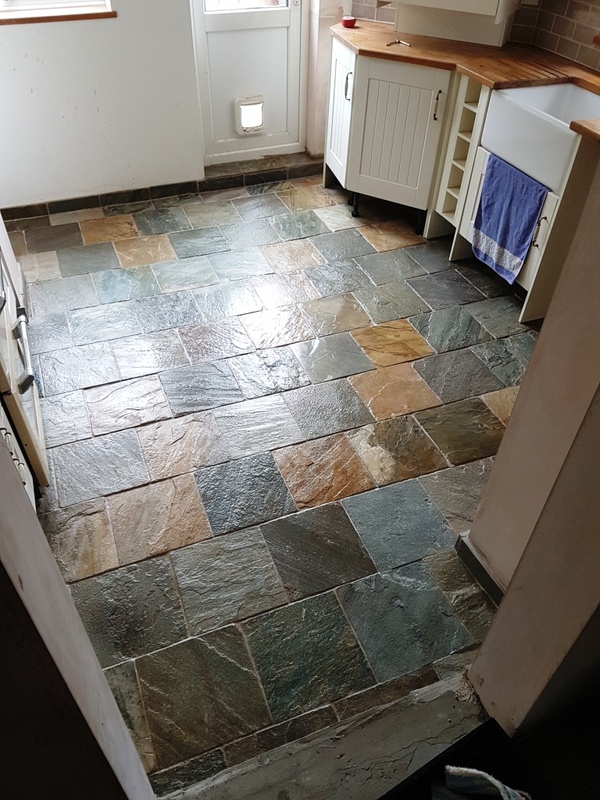 The customer didn’t want a polished finish for the floor – instead requesting a natural look – so I opted to seal the tiles using Tile Doctor Colour Grow, which both enhances the natural shades in the stone and provides a matte finish. 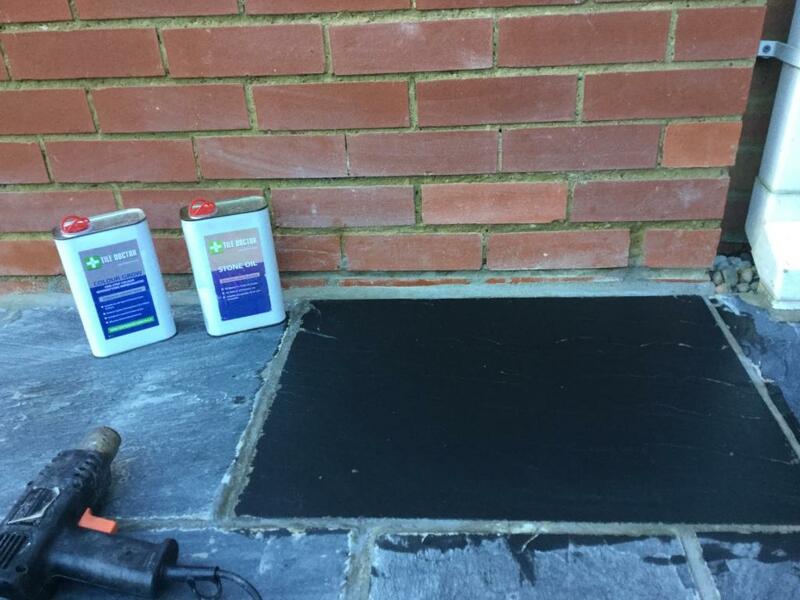 Colour Grow is also an impregnating sealer, meaning that it penetrates the pores of the stone to fill them with sealer thus providing maximum protection against ingrained dirt and stains. I applied three coats of the sealer to the floor, leaving 30-45 minutes between each coat. Once dry, the floor could be walked on within 45 minutes. I advised the customer not to subject the floor to heavy use for the next 48 hours whilst the sealer cured. The sealer provides a low maintenance finish that should last for many years if proper care is provided. To clean the floor thereafter, I recommended that my very happy client use a damp mop in combination with Tile Doctor pH Neutral Tile Cleaner. The product needs to be diluted correctly and the floor mopped using a second bucket to rinse the mop so that the suspended soils are not deposited back on to the surface of the floor.